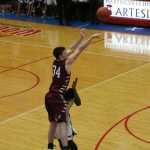 MARTINSVILLE -- Bloomfield coach Matt Britton mentioned earlier in the week in order for the Cardinals to have success in a loaded regional field, seniors Brandon Van Sant and Eli Combs needed to have big games. Message received. Combs buried a corner three with 42 seconds left in regulation to erase a 3-point deficit.